Denis’ photographic career has taken him to over 60 countries where he has amassed a wealth of mesmerizing images. His work has been published in numerous magazines, periodicals and books, including “Photographic Magazine,” “Smithsonian Magazine” and most recently the BBC documentary series “Planet Earth” which aired on the Discovery Channel. He is the receiver of the Gallery Award, Eastman Kodak’s highest honor for a professional photographer. He lives in NYC with his wife Lisa and sons Jake and Cary James and is currently working on his next documentary. After a tour of duty in the Marines, Fran attended college at the School of Visual Arts in Manhattan majoring in advertising and media arts but later switching to sculpture. Following his passion for fine arts he trained under world renowned sculptor Joel Perlman. Part of a team of architects, artists and engineers that restored and expanded a rare masterpiece by legendary Bauhaus architect Mies Van Der Rohe, his work has been exhibited in various shows around the city. Over the past 20 years his love of art and history has taken him to the four corners of the world, participating in numerous expeditions and archeological digs. Today, when not found mentoring to high school students or lecturing on his travels,’ Fran could be found in his studio working on his next project. Buddies since their college days at the School of Visual Arts, Denis and Francis’ friendship survived the journey. Both members of the Explorers Club, they still travel together sometimes. 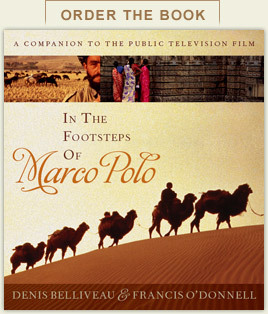 'In the Footsteps of Marco Polo' nominated for an Emmy®! "It was the best-documented journey of its time, inspiring the imaginations and ambitions of countless adventurers, including Christopher Columbus. Now we, too, can follow in the footsteps of Marco Polo, with guides as vividly exciting and engaging as Marco himself. With both their film and this book Denis and Francis have recreated what Joseph Campbell would have applauded as 'The Hero's Journey.' Come take it yourself and you'll never turn back." Major funding for In the Footsteps of Marco Polo was provided by The Starr Foundation. Additional support was given by the Center for Cultural Interchange. ©2019 WNET. All Rights Reserved.